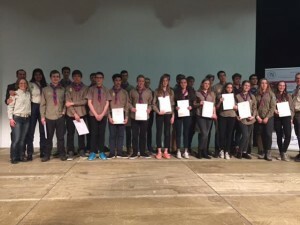 'Telstar Explorer Scout Leaders were made proud when 23 Explorer Scouts ( 14 Bronze, 8 Silver and 1 Gold) received their 'Merite Jeunesse in Luxembourg (the Duke of Edinburgh's International Award)' on 20th April from Prince Guillaume. In total 200 young people received their award and Telstar was the largest visibly represented organisation. The 'DofE' award offers many life long benefits to young people. It's an holistic package – 'body, mind & soul'. It provides life long memories & binds friendships. This now gives Telstar a running total of 40 Bronze, 24 silver and 10 Gold Awards. BRAVO Explorers – we salute you and also your excellent leader team who facilitated this excellent achievement.